drinking vessels decorated with it in the belief that it would prevent intoxication. It is one of several forms of quartz. Amethyst is a semiprecious stone and is the traditional birthstone for February. Amethyst is Quartz, which means that it is capable of increasing the size of your bio magnetic field by 100% within seconds of standing in its presence. This can replenish lost energy eroded by depressive episodes or physical harm. It can also increase your energy levels. Negative ions are free electrons with a net negative charge. Ions are broken molecules with special electrical properties. Since they are broken, they naturally seek out other molecules and compounds for which they can combine. 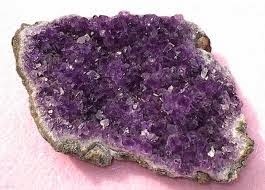 Amethyst crystals emit negative ions and can bring about the benefits of negative ion emission. The low level of heat emitted by amethyst crystals may help provide a sense of calm for the body, possibly providing favorable effects for supporting a healthy sleep cycle. far infrared radiation-emitting discs were placed under the pillows of subjects during sleep. Subjects with the radiation-emitting discs hidden underneath their pillows reported a statistically significant increase in overall life satisfaction.